Richard Mille’s third boutique in the United States, the Richard Mille Boutique Bal Harbour, debuted on April 10th within Florida’s Bal Harbour Shops. The new boutique becomes the brand’s first location on the East Coast. 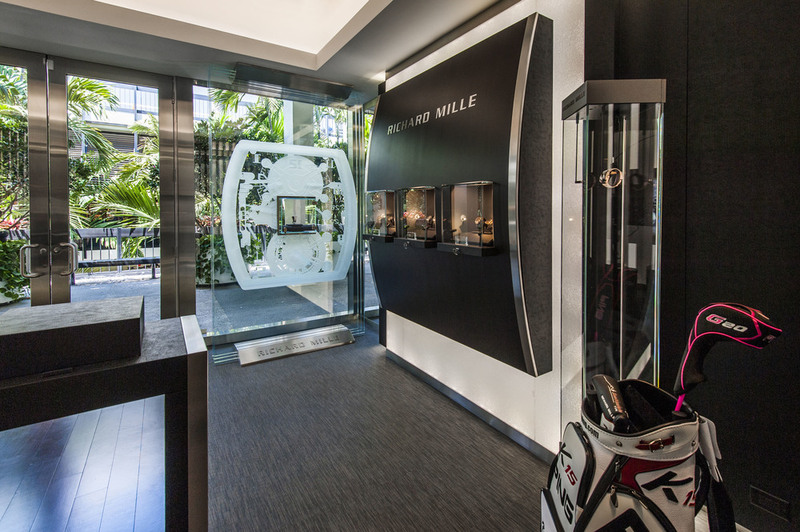 The Richard Mille boutique resides on the second floor of the lushly landscaped, open-air Bal Harbour Shops. Situated north of Miami, between the Atlantic Ocean and Biscayne Bay, the 100-brand shopping mall is designed to celebrate the balmy natural beauty of South Florida. It regularly ranks as the most productive shopping mall in America with the highest sales per square foot. Two triple-pane glass sculptures in the shape of Richard Mille’s iconic tonneau watch flank the front door of the new boutique. Above the entrance, an illuminated panel of cracked glass provides a welcoming glow, while inside the boutique, black textural «elephant skin» fabric contrasts with brushed steel trim, Makassar wood, and additional illuminated panels of cracked glass. The decor of the entire space adheres to Richard Mille’s warm and functional design identity, and features intimate seating areas, images of friends of the brand, and spacious high-tech antireflective glass showcases. The complete collection of Richard Mille watches for men and women is available at the new boutique, including the Rafael Nadal series of timepieces, and such limited editions as the RM 38-01 Tourbillon G-Sensor Bubba Watson, the RM 19-01 Tourbillon Natalie Portman, the RM 60-01 Regatta Les Voiles de St. Barth, and the RM 50-01 Tourbillon Romain Grosjean. The Richard Mille Boutique Bal Harbour, within the Bal Harbour Shops, is located at 9700 Collins Avenue, Bal Harbour, Florida, and is open Monday through Saturday from 10 a.m. to 9 p.m., and Sunday 12 noon to 6 p.m.
For more information please visit their website www.richardmille.com and read the article about this bespoke watch brand in our upcoming 6th issue.